the little girl in hillary clinton's notorious "3 a.m. / red phone" ad -- the girl who is sleeping comfortably under the covers while a phone in the white house is ringing off the hook, the girl we know could easily be snatched from her bed, taken to an undisclosed location outside buffalo, immediately shackled into stress positions, hooded, and forced to listen to jody whatley music at unbearable levels for 24-48 hours...yeah, that girl -- well, she's 17 now (those sleeping girl images were from her childhood.) and the breaking news is: she supports barack obama. 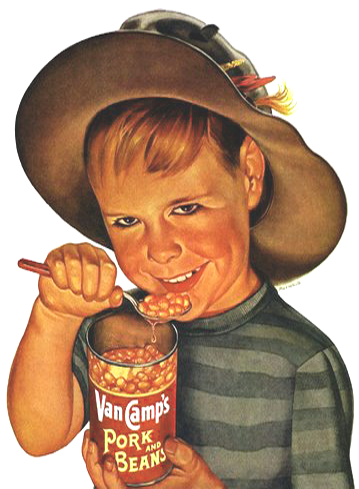 on a similar note, this pork and beans boy supported mike huckabee, the shake-n-bake "and i helped" girl actually is cindy mccain, and all of the "i am stuck on band-aid and band-aid's stuck on me" kids have created a 527 group to produce universal health care attack ads for hillary. and perhaps not surprisingly, anyone ever involved in a "you got your chocolate in my peanut butter...you got your peanut butter in my chocolate!" ad is supporting a clinton/obama ticket. I clicked through to them a bunch of times just to bleed them of a little money. . .
just wonder if the character of your advertisers are in line with your beliefs.